I'd say that canoe tripping is my passion and September is probably my favourite month to indulge myself! The past summer season hadn't been particularly summer like in it's weather and it was looking like the trend was going to continue. My friend Daniel and I try to get out for a trip twice yearly, mid May and mid September, and we had planned a loop from Sandy Inlet on Lake Temagami up to Maple Mountain and then return via the north and south channels of the Lady Evelyn River with an extension through Bob Lake and the Canton Lakes route back to Sandy Inlet. Time was a bit compressed for this trip and we planned on 5 nights and 6 days. I left Sudbury around 7:00 am and headed for North bay to pick up Daniel. Of course it was cold, wet and raining - par for the course this year. After a quick coffee we headed north for Temagami with a quick stop in town at the Temagami Outfitting Company, for permits. Next stop would be at the parking area off the Red Squirrel road at the Sandy Inlet put in. The road is good however, the last 500 metres or so to the last parking area is rough with some large and deep potholes. Of course they were all full to the brim with all the rain we'd been experiencing over the last while! It's about a 300 metre portage from the parking area down to the beach and we donned our rain gear, parked the RAV and headed off for another adventure. 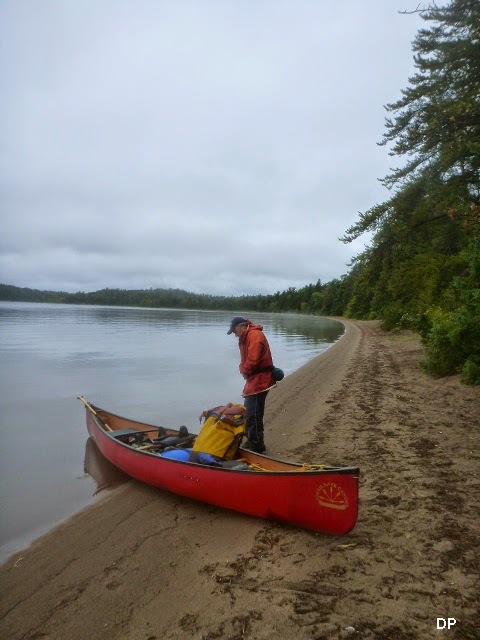 The plan for the day was to head across the bay to the Napolean portage and then head north through Sharp Rock Inlet, Diamond Lake and camp somewhere on Lady Evelyn Lake close to the portages across to Willow Island Lake. 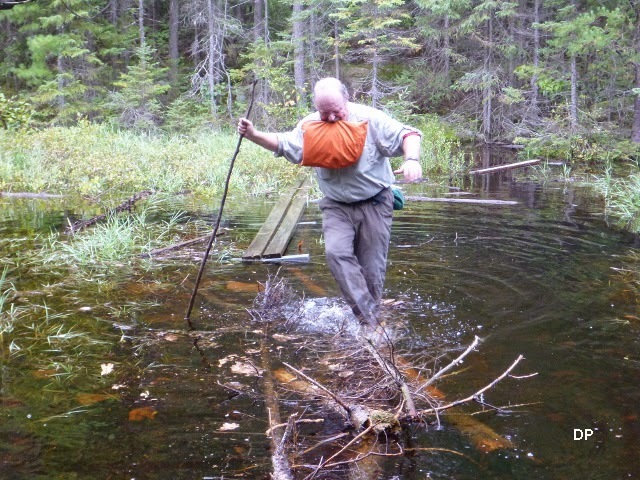 We headed across the Napolean portage where we found several large pond like areas and a stream flowing in various spots along the port! After a quick lunch under the cedars at the end we pushed off headed for the Sharp Rock Inlet port into Diamond Lake. The rain eased up somewhat and became intermittent for the rest of the day but steady enough to leave your rain gear on. A quick lift over at Lady Evelyn falls into Lady Evelyn Lake and we were on the final leg of the day. 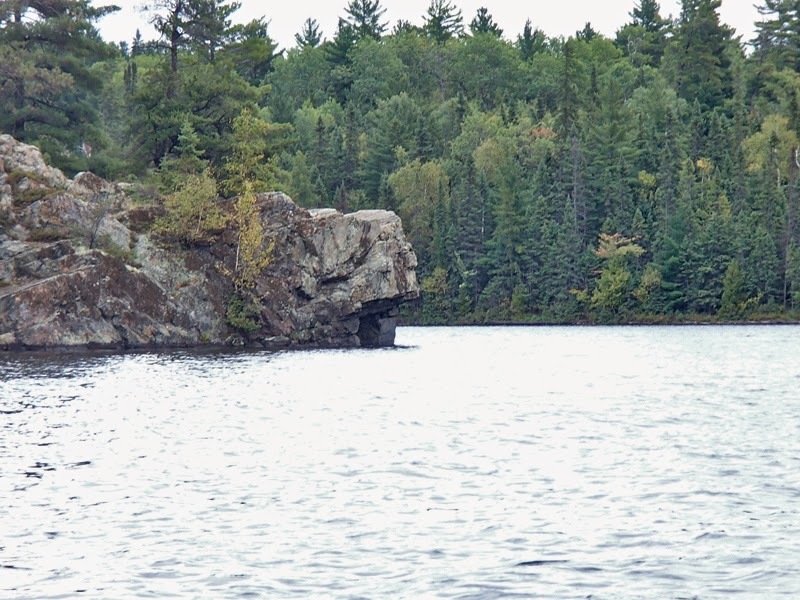 There is an interesting rock formation about 20 minutes north of the lift over on the end of a small rocky island called Indian Head. We were probably an hour or so up the lake when I discovered that my nalgene was missing - must have left it at the lift over, I will miss the insulated sleeve more than the actual bottle - have lots of those! 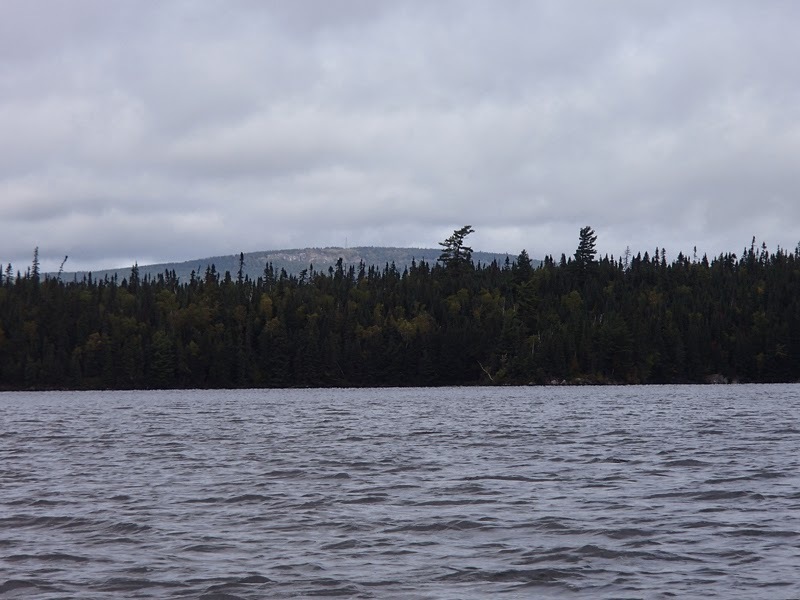 We continued north and as we approached the area where Lady Evelyn Lake opens up we could see whitecaps rolling in from the north. Fortunately we were turning west before the opening and stayed in behind the islands in much calmer waters. We pulled up to a small site situated on the north end of a small island and called it a day. We set up a tarp first before as it continued to rain on and off all evening long. Once done, Daniel set up his tent and I hung my hammock and gathered some wood. A nice steak dinner finished off the day and we turned in with the sound of rain on the tarps and tent fly. Distance portaged - 1230 m.
We awoke to a complete silence except for drops of water falling onto the tarp and fly from the trees and the lake completely hidden in fog. As we slowly packed our gear and ate some breakfast the fog slowly dissipated revealing another overcast day with the continued threat of more rain in our future. We finished packing and hit the water for a quick 2 km paddle to our first port of the day of 400 m. into a small lake. Another quick paddle and out the boat and across a 500 m port brought us to Willow Island Lake. Here we turned north again and headed off for the narrows between Willow Island and Sucker Gut lakes. 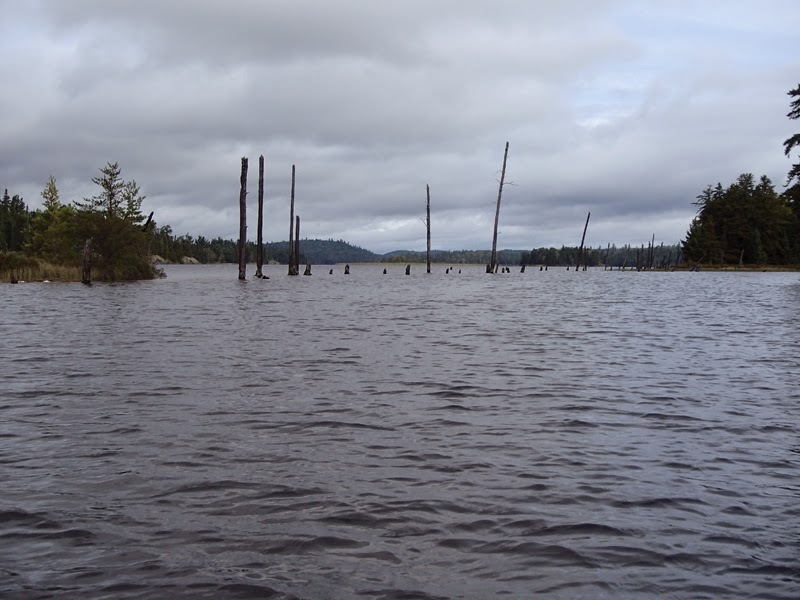 There is a dam on the Lady Evelyn River north of Lady Evelyn Lake and the lakes upstream of the dam are all reservoir type lakes with many old standing drowned trees dotting the shoreline areas. We continued north and finally turning rounding a point to the west and we caught our first glimpse of Maple Mountain and the fire tower on it's peak. With all the rain this past summer, water level marks on the rocks were consistently only 4-8" below the high water marks. We turned north again up the creek for Hobart Lake we had to push a little harder to make headway against the fairly substantial current. The sun decided to show its face a bit more today and we enjoyed every minute when it showed! Lunch was taken at the large eastern campsite on Hobart Lake. 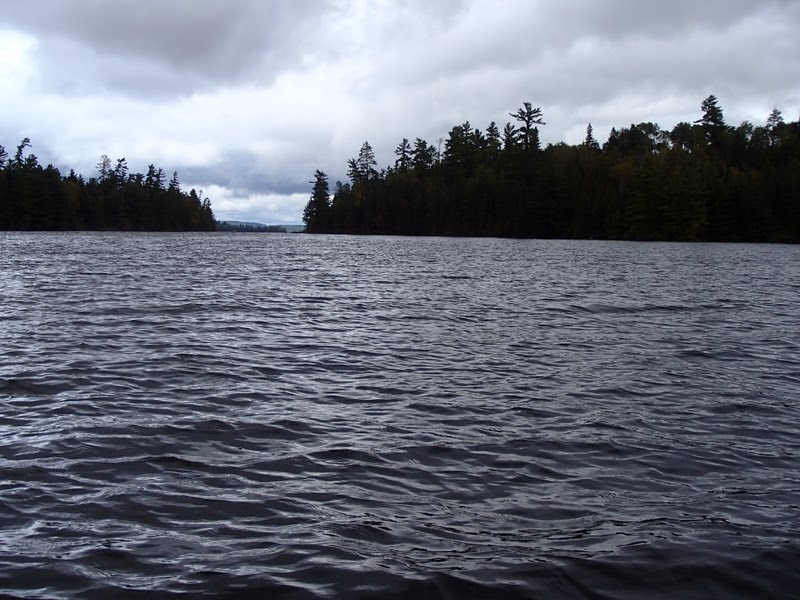 During busy periods most folks stay on Hobart Lake as there is only 1 recognized campsite on Tupper Lake, but we hadn't seen anyone since the Napolean portage and we planned on staying on Tupper Lake. We headed off after lunch and were soon setting up camp across the lake from the trail to the summit of Maple Mountain which we planned to hike in the morning. The rain held off till we were set up but we did get showers off and on for the rest of the day. Distance portaged - 695 m.
Day 3 dawned with a bit of drizzle and an overcast sky with the summit of Maple Mountain obscured by clouds - go figure! We ate some breakfast and broke down and packed most of our gear except for the tarp and headed off to hike up the mountain hoping that the ceiling would lift and we could actually see something. A quick paddle over to the trailhead and we were off with our rain gear and water bottles. 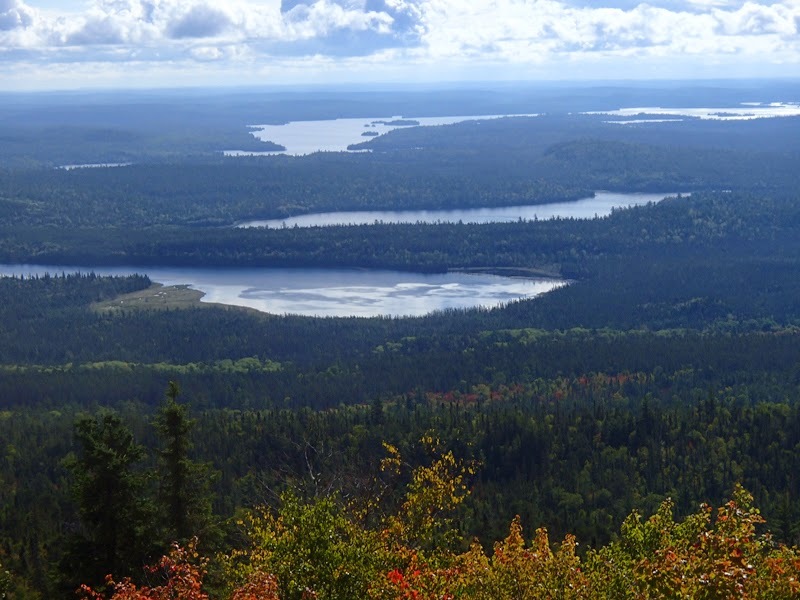 Its about a 3 km hike from lake to summit and there is a 300 metre elevation gain, not a casual stroll. Due to the steady summer rainfalls there were several wet areas to cross that are normally not much of a problem however we did get a wee bit wet along the way. We did catch a nice break on the way as the sky cleared off and the sun came out when we were approaching final 1/3rd of the hike. The last piece involves climbing up a steep area just to the side of a pretty massive cliff. 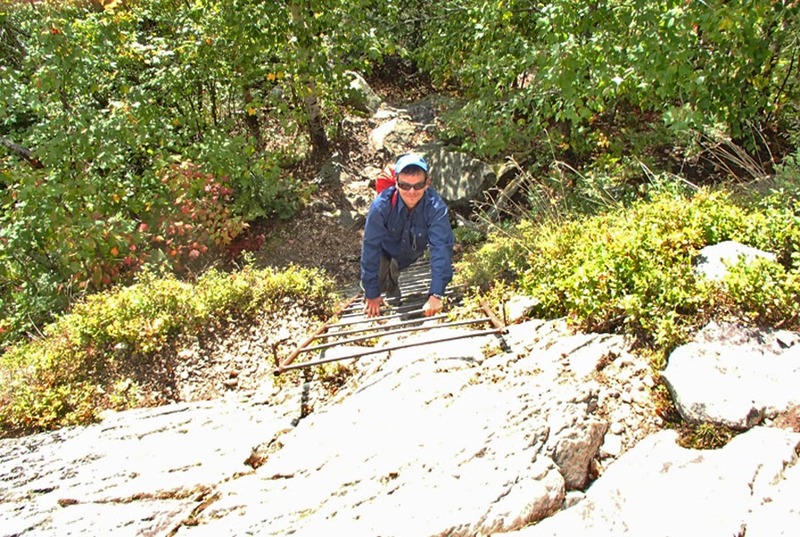 A section of an old ladder from one of the towers enables you to climb a particularly steep section easily and from there its a cautious scramble up to more level ground and the path to the tower. Once past the steep sections we found numerous blueberry bushes still laden with fruit and enjoyed a nice snack. We wandered up to the tower, enjoyed the various views and soaked up the welcome sunshine. In all we spent about 45 minutes before heading back down. It was well worth the time and effort to get there and it was like the weather decided that it would give us a break because as we descended back to the canoe it clouded over again and began to spit on and off. Its a 3 km hike up the mountain and with our 45 minutes on the summit it was about a 3.5 hour round trip from the campsite. Once at camp we ate lunch under the tarp, finished packing and headed back through Hobart Lake and on into Sucker Gut where we stopped and pulled out the rain gear again as numerous showers were passing through the entire area. We headed straight south into and through a small creek that connects to Chris Willis Lake. In normal summers and low water periods this creek often needs to be lined and the canoe lifted over shallow spots etc. This year - no problem we paddled the entire distance. There is an outfitters cabin on Chris Willis and we ran into a couple of surprised fisherman wondering where we came from and where we were going! 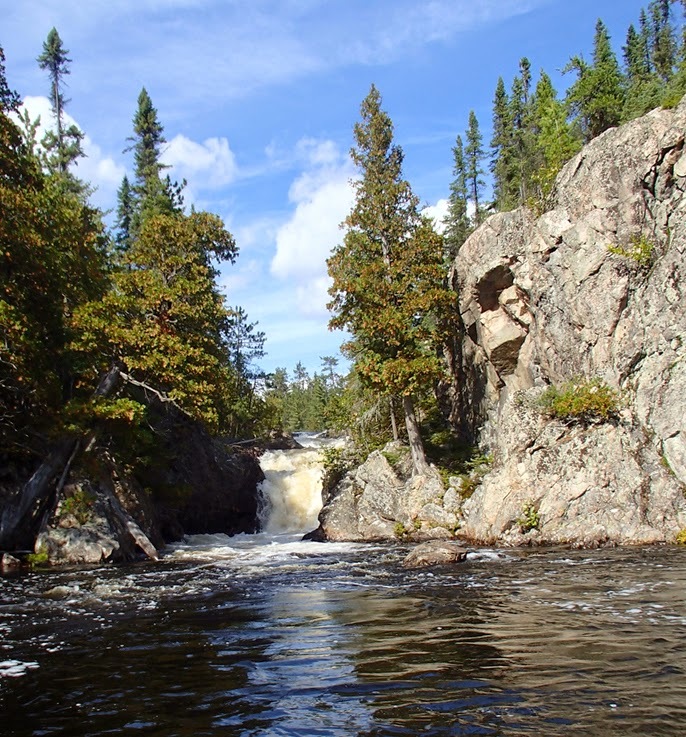 We reached the southeast corner of the lake and the 400 m. portage into the north channel of the Lady Evelyn River just upstream from Frank Falls. 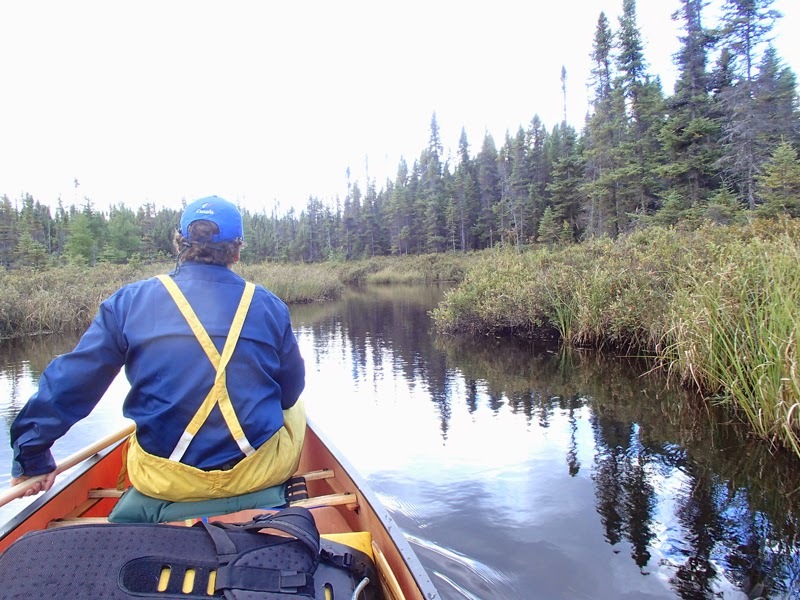 We launched and headed upstream as our plan was to paddle to the fork of the river and take the south channel of the Lady Evelyn back to Willow Island Lake. We portaged past Center Falls (in a rain shower) and one small rapid before setting up camp just below Helen Falls for the night. Distance portaged - 1035 m.
Sometimes you win - it was raining when we hit the sack the night before but when we arose it was to clear skies and sunshine, although tarps were slick with mist from Helen Falls. Today we would be heading down the south channel and across some of the toughest portages in the Temagami area. We headed off in high spirits and quickly passed over the 3 ports between Helen Falls and Katherine Lake where the river divides. From here we turn and head down the south channel with its falls, rapids and portages to come. 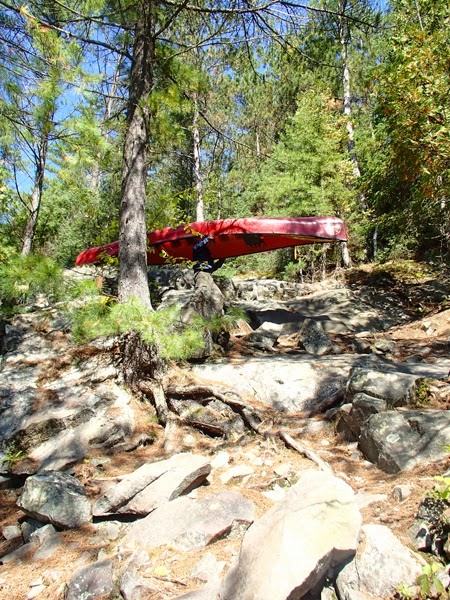 The first rapid is quickly lined and the second is portaged and we arrive at Cabin Falls. The port is river left and very rocky and steep in sections but only a taste of what's to come. We stop at the bottom for a break and take some photos of the falls and cabin built overhanging the brink of the falls before pushing off again. 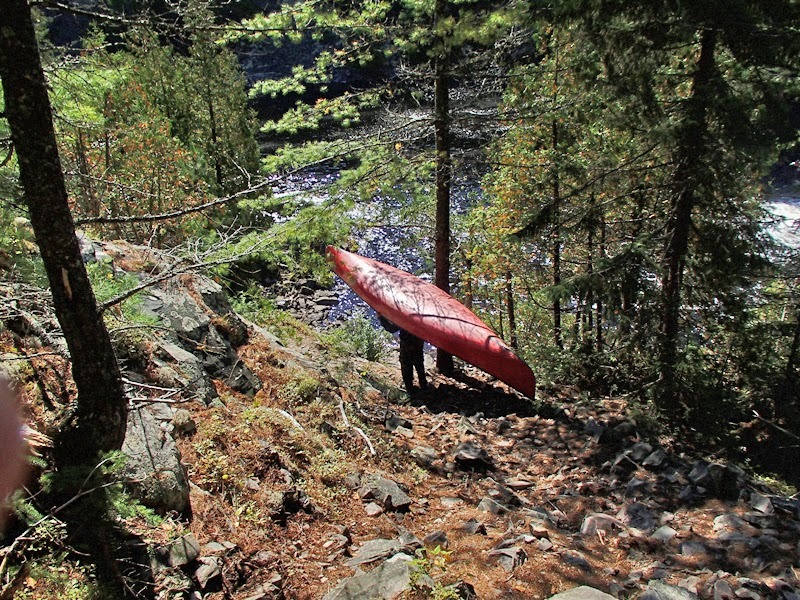 Next up about 1 km downstream is Bridal Veil Falls and with it comes an even steeper portage! 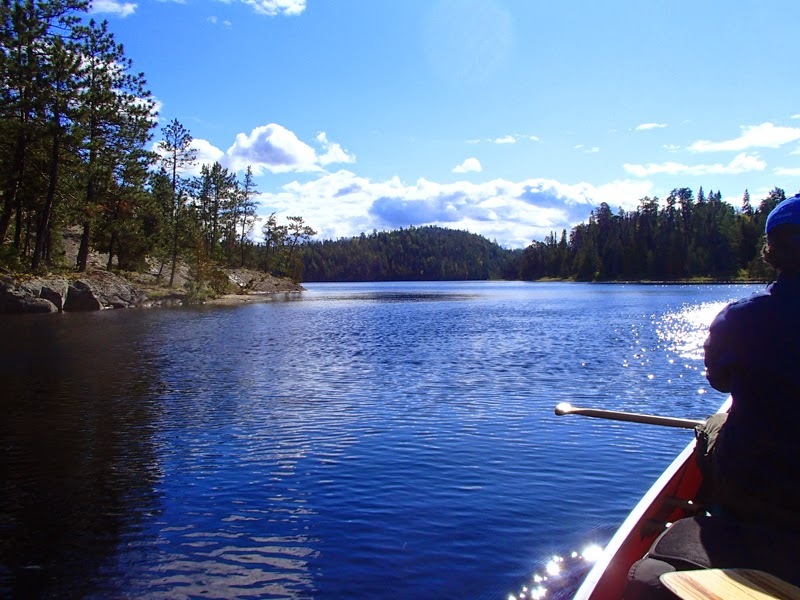 This is one of the most beautiful and rugged canoe routes in all of the Temagami canoe area and the work to perk ratio is high but more than worth the effort. 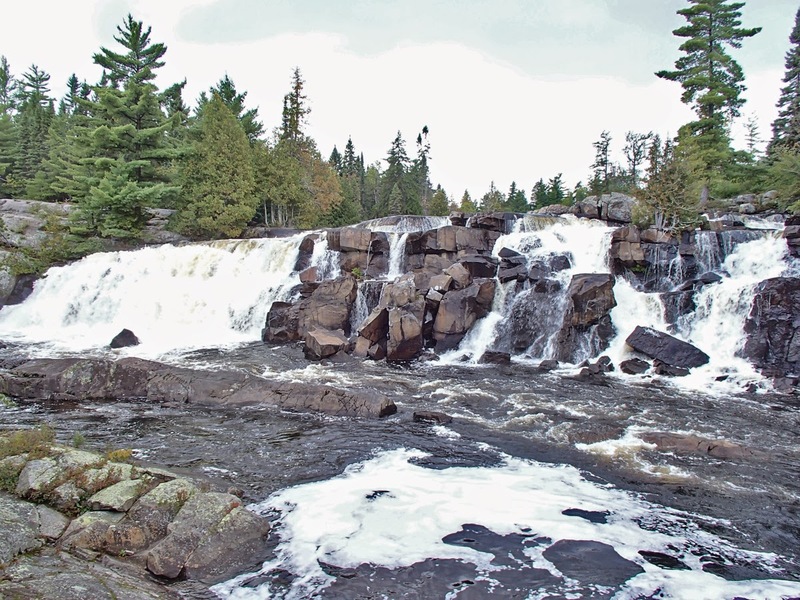 After a leisurely lunch we again push off headed for a set of rapids called Temptation Alley in Hap Wilson's Temagami canoe guide. 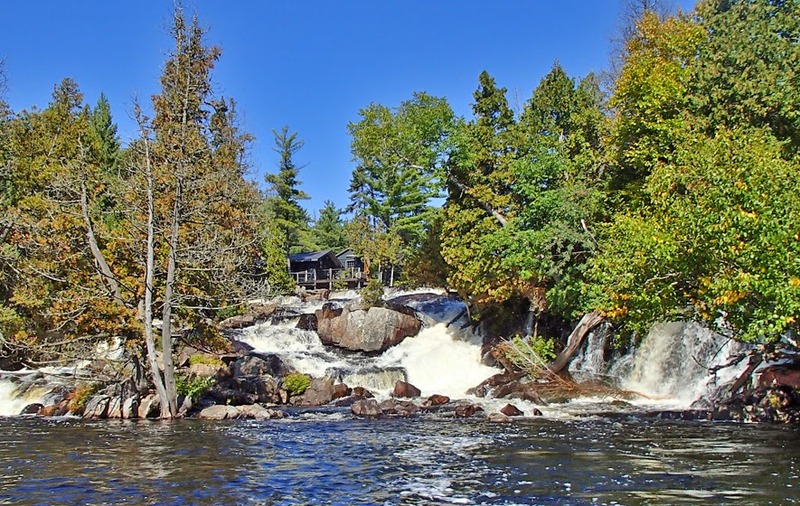 Its described as a classic boulder bash and at these water levels its very tempting but a 40 lb kevlar canoe is a prime candidate for a serious munching with any mistakes and we elect to line the top part of the rapids down to the first pool (takes longer than to just do the portage!) where we pull out and carry the last half. 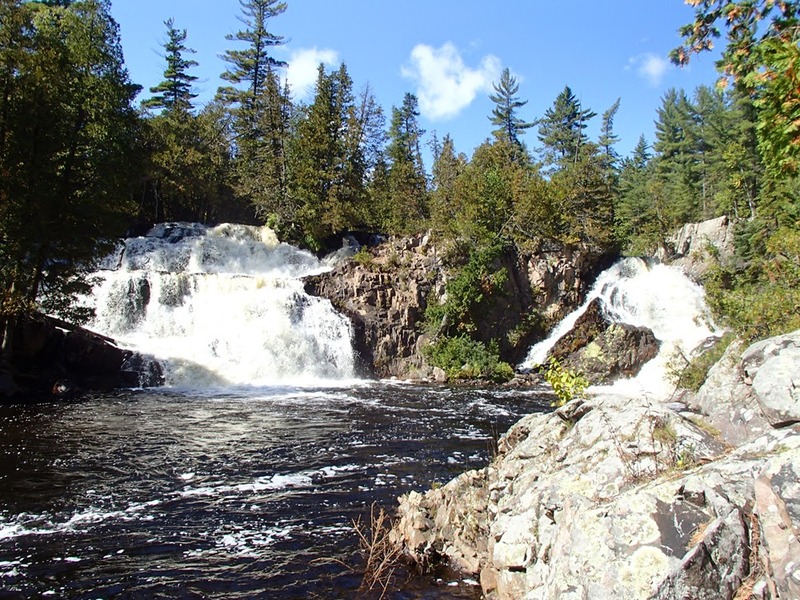 Next up is Fat Man's Falls, another short but tight and steep portage with a tricky put in at the bottom, take care here! There is one last 300 m. portage below Fat Man's that we do before setting up on a small campsite for the night. It is mid afternoon and we take the opportunity to dry some things out before supper. It is not to last though as it begins to cloud over around 6:00 pm and it begins to rain again around 8:00 pm. We were fortunate to have such a nice sunny day to travel this portion of the river, to enjoy the spectacular rugged beauty and to travel the ports on dry rock! Distance portaged - 2525 m.
You guessed it, rained overnight and a misty morning with a heavy, leaden sky promising some serious precipitation later in the day. We eat and pack and paddle off downriver with the "2 Miler" portage from Willow Island Lake to Diamond Lake to look forward to. We continue south and come across an otter feeding in the shallows above a small rapid. He knows we're there but is totally unconcerned and continues to dive and surface and eating while we paddle within 15' of him. He is so quick and busy that we cannot get anything more than a blurry photo of his back or the disturb water surface! Soon enough we are at the beginning of the 2 miler portage. The last section is along the marsh of the creek emptying into Diamond Lake but we're sure there is enough water to actually paddle the last 800-900 m. The port begins with about an 800 m. section of gently rolling terrain which then morphs into a 1000 m. slog though a boggy area which in turn morphs into a 1100 m. walk through rock terraces and easy climbs in pines till you hit the marsh. We paddle the last section! We load the canoe and the skies finally open and it begins to rain hard, driven by a cold northeast wind. As we turn the corner from the creek into Diamond the full force of the wind and rain drive into our faces and we quickly button up our rain gear as tight as possible. This is an all day rain and we had planned for another night/day on this trip - from Diamond Lake to Bob Lake and out through the Canton lake route back to Sandy Inlet. We stop for a cold lunch under some pines and discuss our options finally deciding to continue and as we reach a change point i.e. 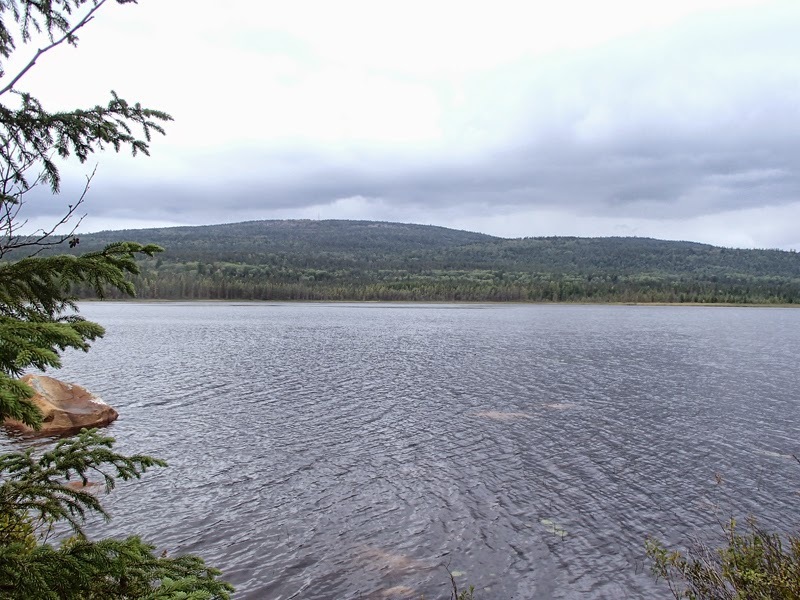 - the portage to Bob Lake, we'll see if we want to continue that portion of the trip. 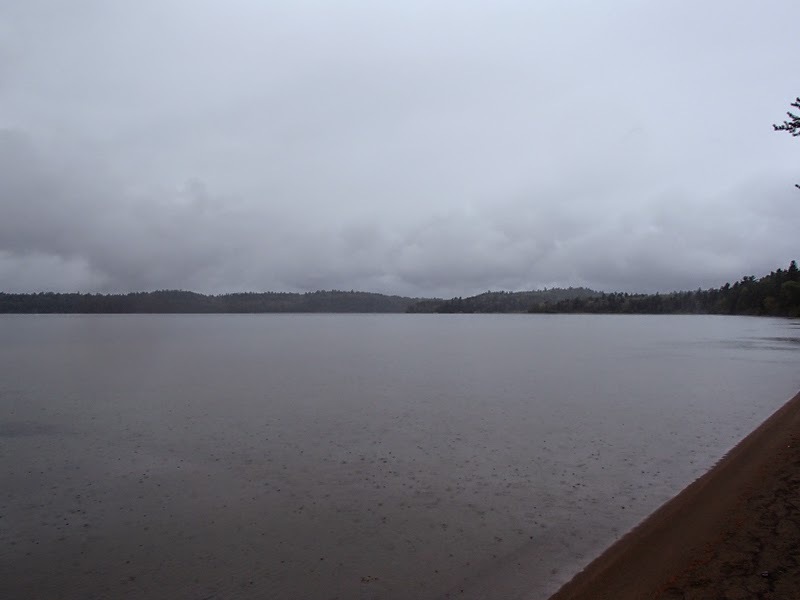 We reach the port and its still pouring so we decide to head for Lake Temagami and see what the weather is doing and maybe camp at a site along the way. 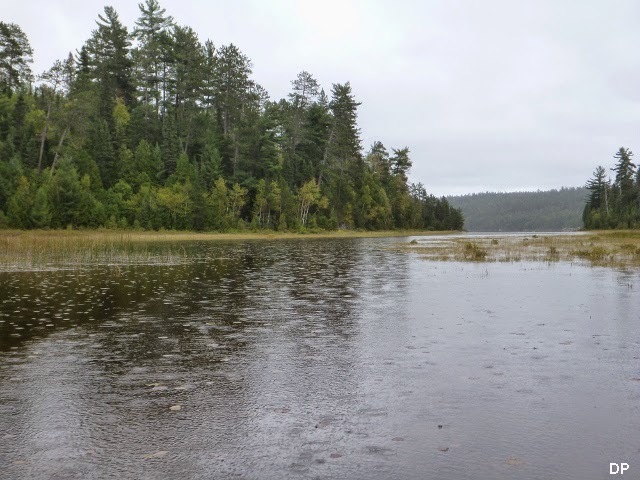 We back track down Diamond and cross the Sharp Rock portage into Lake Temagami and as we pass different campsites nothing is changing -still raining, still a cold north wind, gear still wet - you get the idea. 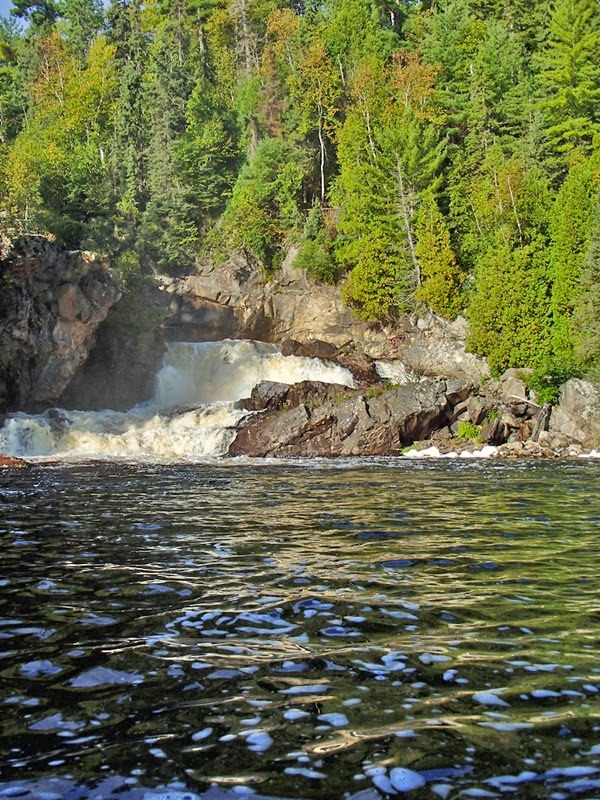 We pass the last campsite and head over the Napolean portage and we're back to our start by 4:00 pm. We load the vehicle and head off for North Bay to drop off Daniel and it rains most of the way there, in fact it's still raining at 9:00 pm when I get home to Sudbury! In spite of some of the weather it was another excellent trip through some of the most rugged and beautiful country around - do it again in a heartbeat. Distance portaged - 3565 m. - Total - 9050 m.
Deep Freeze, February 14 - 22, 2015.